Home News Fröhliche Geburtstag, Ludwig! When I was in my early twenties, I had some serious Beethoven love. I would listen to one of his symphonies over and over again, two or three times, every evening. By listening I mean really listening. I’d sit in front of my record player not doing anything else but listening. I’d follow motifs as they developed, marvel at the orchestration, note the use of dynamics. On a long-playing phonograph record, a symphony would fit roughly two movements on one side and two on the other. Sometimes the work didn’t fit nicely and there would be a break in the music so one had to flip the disc quickly to keep continuity. That was one of the definite downsides to LPs. There were movements that really got me, for example, of course (the second in the 7th), the first in the 3rd (Eroica), and the fourth in the 6th (Pastoral). The last movement of the 9th still gives me shivers especially when the vocal quartet is cooking. . You can hear one of those great dramatic moments just before the end. That’s at about 21:00 in this fun graphical youtube of the Philharmonia Baroque orchestra’s rendition. Beethoven’s music has been used countless times in film scores. It is amazingly cinematic. Here’s a short list. 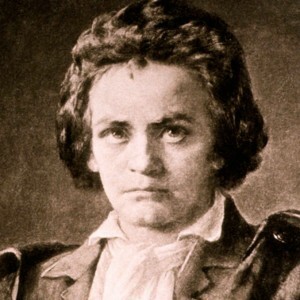 There is no denying that modern film composers, learnt and/or borrowed plenty from Herr Beethoven. Danke sehr, Ludwig! I am glad I got to know you. Death, ever interested in the morbid, insisted I add something about Beethoven’s end, so here is a link to the Wikipedia entry about Beethoven’s death which shows the famous death mask. Experts are still not sure what the cause of his death at 56 was. This reconstruction of his appearance is from a “life mask” taken when he was in his forties. death mask, life mask, ludwig beethoven, ninth symphony.